"Relax! Don't be so stiff," Haralambos Loukaras, island economist and President of the Rhodes Squash Club instructed his recently arrived American squash guest seated behind him on the scooter, my hands sweating profusely and awkwardly clamped to Haralambos' hips. If you ever want to get to know someone fast, share a scooter ride. 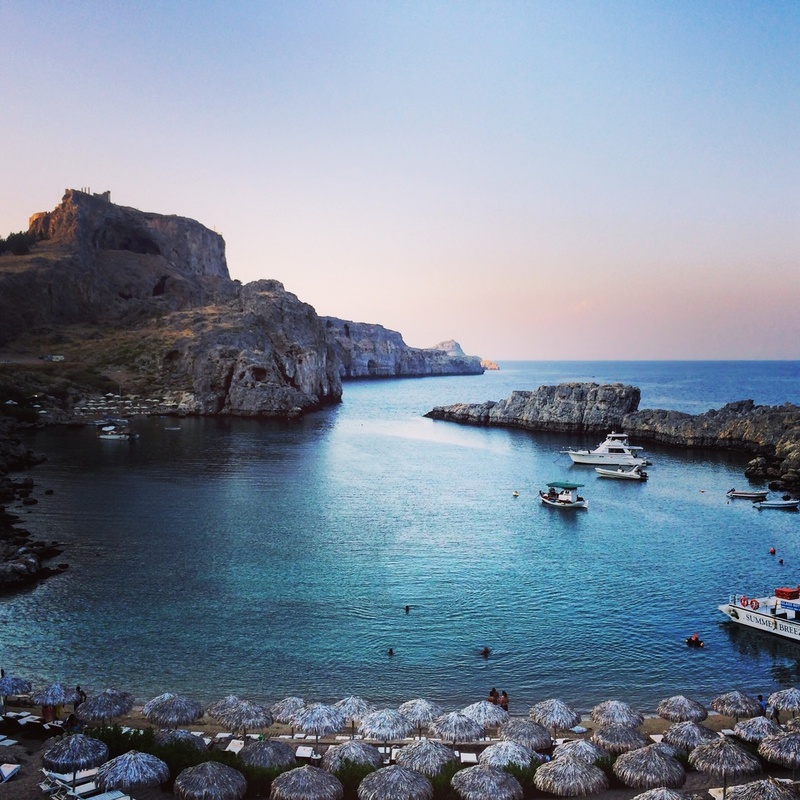 I tried to readjust my hold on the squash-playing economists' torso as he zipped us along the dusty streets on the Greek island of Rhodes, ancient stone cut walls of a 3,000 year-old city on one side and the crystal blue Mediterranean Sea on the other. Since I left Boston last year there have been a few times where everything seems to pause and I look around and wonder, "how did I end up here???!" Zipping along this dot of land off the coast of Europe, covered in sweat and draped over the back of Haralambos I laughed and hung on tight to Haralombos. This was one of those times. 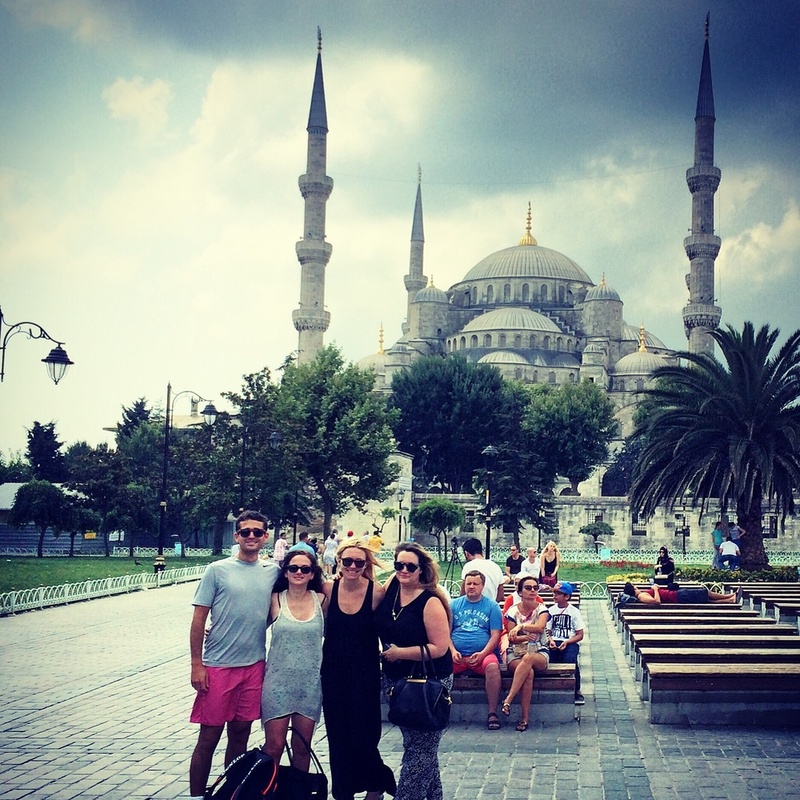 The trek from Australia back to Europe for a string of four tournaments meant a stop in Istanbul, Turkey, which meant crashing a "Girls Weekend" organized by my friend Ashley and her three friends in town then as well. 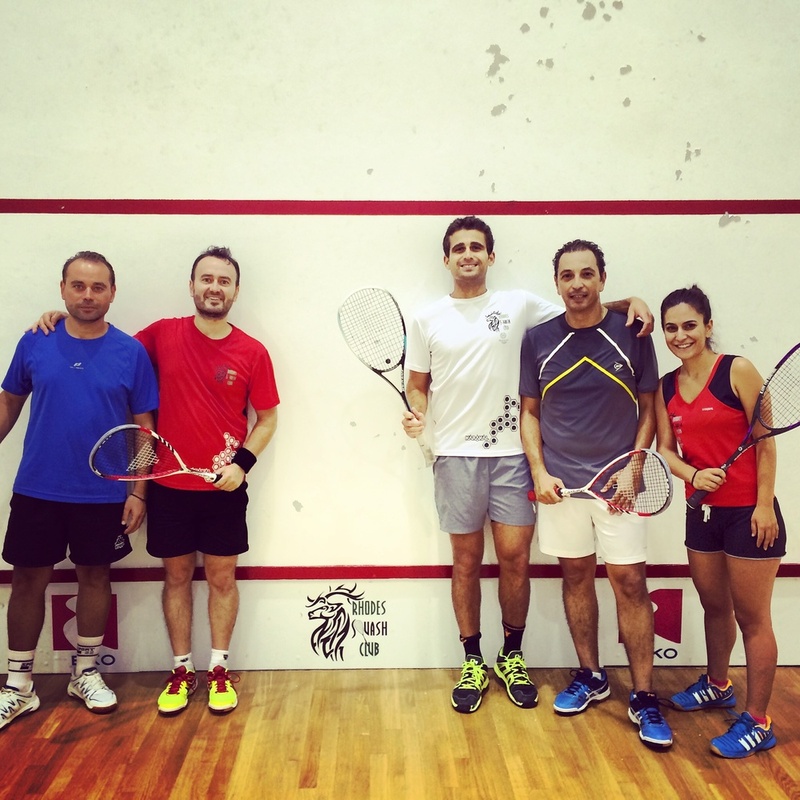 Having touched down in Turkey, I lobbed in a couple e-mails to squash friends asking about the squash scene in nearby Greece. Four different email introductions later and the dots were connected to Haralambos. Training, coaching, and a couch awaited in Rhodes. Haralambos set me up with his friend Vasilis, a former semi pro volleyball player who now runs his own small IT company, and, like Haralambos, is also a squash fanatic. It was the peak of an already sweltering summer on the island, the type of heat that gets you sweating before you're out of the shower. I slept on the couch in the living room, kept cool from the winds coming in off the sea and quickly adopted the Mediterranean diet around baskets of fresh figs and handfuls of nuts and feta cheese and grilled veggies because, well, it was too hot to eat anything else. For lunch we would split a chicken from the charcoal grill at the market, with Vasilius chopping romaine and tomatoes and his favorite feta while carefully explaining the wonderful different facets of the cheese: "the are many types of feh-ta. Soft. Hard. Salty. Sweet. Many types." We ended most nights at the locals' gelato spot- tucked away from the tourists in the other end of town, open til 3 or 4 in the morning. As we chased down the gelato before it melted away, Vasilis told me about the challenges with Greece today, both tangible (his struggle to get paid on invoices) and intangible (the widespread angst and uncertainty of what could go wrong next). "I pay 70% in taxes...I'm getting robbed." Haralambos, in his economist tone, tried to be more measured. "We will survive...we have to survive." He paused and looked out, reflecting for a second. "We will see." 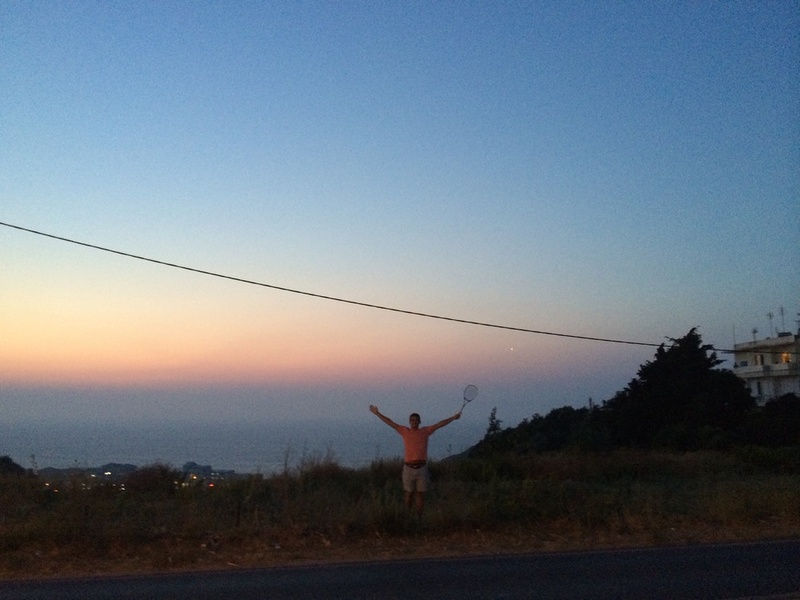 When the sun disappeared we would hit the courts for hours in the evening, me and the small but intensely passionate players of the Rhodes Squash Club, taking over the two courts on one end of a resort hotel. The first night I coached Vasilius and Jimmy, Kiki and George, and hours later trained with Haralambos. By dinner that same night Vasilius had phone calls from three more players, asking for the sign up sheet. Vasilis explained that there are no coaches on the island, and so when pro players come through town, word travels fast. Driving home from squash we would pass a non descript stack of pillars - remains of temples from early century BC that look like the type you'd see on a Hollywood set, except real. Housing plots marked off with fences speckle the city streets- "abandoned houses?" I asked Vasilis driving by them one day. "No," he replied casually, "That's when they are starting to build and discover ancient remains. So they're not allowed to keep building." In the States it's something if you find an artifact from colonial times. This was a few thousand years before then. I figured they must have found all there is in Rhodes but Vasilis said they find more every day. "They're still digging." On an off day we packed up some more nuts and figs and cheese and drove south of Rhodes to the quieter beaches and cliffs of Lindos. Along the way were relics of a checkered history- at one point the Turks controlled the island and later the Italians occupied it during the Second World War, leaving behind legacy remnants like Mosques and tons of gelato shops. For dinner on a few night we ventured through the stone castle walls and into the old town, the largest of the last few remaining "living cities" in the world, going back centureis and still functioning today. Unesco Heritage Sites are used to preserve a specific monument or statue; this place was a Unesco Heritage City. On the way out we passed an old church where members come to offer fanouropita, a special pie they would bake if they lost something. After a few days of giving the pie away, it is said to bring good luck in finding what you lost. I was bummed not to see any fanouropita handouts as we walked by. On my last night in Greece, one of the local players Eftihia had me and some others over for dinner. I had traded her squash lessons for a home cooked meal and it was the best deal yet- fresh feta and tomato salad, fresh calamari and shrimp pasta, and my personal favorite: minced meat and rice folded into pressed wine leaves. A local classic that takes time and skill, as her mother spent an afternoon putting together. It was another one of those nights where you're wondering how you got so lucky to run across these new friends, strangers except for a single bond of sport that brought us all here. Around the table, my hosts faced unknowns from a nation in turmoil with an uncertain future in the days and months ahead. And yet that didn't stop them from opening their doors and kitchens to the stranger, making space in their car and dinner table and showing me a sliver into their lives on the island of Rhodes. As another bottle of Greek wine neared empty my Greek friends raised glasses and explained to me a common saying in the country: "Nothing is more permanent than the temporary." Glasses clinked in the warm summer night on the island, somewhere in the Mediterannean.